A cuddly black, grey and white snow leopard, ready to melt your heart. Storm loves the snow, so Christmas and the winter months are his favourite time of year. 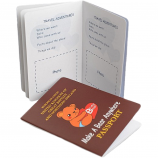 This kit contains Storm Snow Leopard 16" bear skin, super-soft stuffing, star charm, birth certificate, party invitation and deluxe carry bag. Our Storm Snow Leopard is very soft and fluffy with black, grey and white fur to help keep Storm warm whilst walking in the snow and ice. Storm Snow Leopard also has big green glitter eyes. 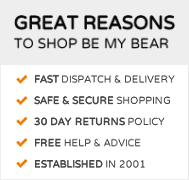 Storm is a member of the sixteen inch range of build anywhere animals from Be My Bear. Storm is a snow leopard (large cat) who lives in the mountain ranges of Central and South Asia. The Kunlun Mountains where Storm roams are one of the longest mountain chains in Asia, extending more than 3,000 kilometres in length. Storm's favourite food is red meat, with ibex and deer one of his favourites. Did you know that the snow leopard can't roar like so many other big cats can, and instead it hisses, mews, growls and wails! Storm Snow Leopard is suitable for children aged three and over and is an ideal birthday gift or great for teddy bear making birthday parties. 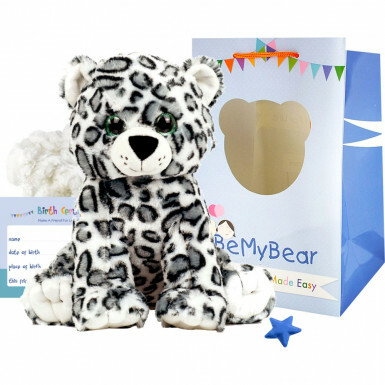 As with all of Be My Bear's teddy bear and stuffed animal making kits you will receive your Storm Snow Leopard skin with one-way zipper, a bag of soft and fluffy stuffing, our satin make-a-wish star charm to bring Storm to life, a birth certificate, party invitations and instructions. To complete the package we also include a luxury gift bag so Storm Snow Leopard can be carried around in style.